Toddlers and preschoolers often engage in pretend play. This allows them to test out new identities, to develop theories about the ways other people think, and to practice social skills. 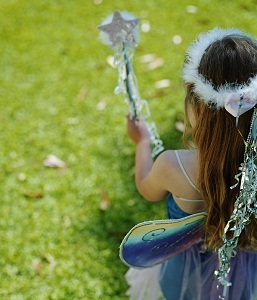 Magical thinking tends to coincide with this pretend play, and young children often have fantastical beliefs about what can and cannot happen. Magical thinking tends to fade as children begin to master concepts of logic and cause and effect. Older children may periodically deviate into magical thinking, but reality-based thinking dominates. In adults, magical thinking can be a sign of a mental health condition. However, some cultures encourage magical thinking about certain things. For example, a tribal religion might encourage members to believe that carrying around a fetish will cause it to rain. This sort of magical thinking is not symptomatic of mental illness because it is part of a cultural norm. Magical thinking is not in itself a mental illness, but is correlated with some mental health conditions. People with obsessive-compulsive disorder (OCD) engage in a type of magical thinking. Obsessive thoughts cause them to engage in compulsions in an attempt to stave off the thoughts. People with OCD may intellectually know that, say, repeatedly tapping a television will not keep them safe, but still feel an overwhelming urge to do so. People diagnosed with schizophrenia and delusional disorders may also experience bouts of magical thinking. Thank you for your comment. If you would like to get in touch with a therapist for your daughter, you can search our directory for mental health professionals in your area here: https://www.goodtherapy.org/advanced-search.html. To specifically see therapists who work with adolescents, please select Children and Teens from the drop-down menu on that page. From there, you can get in touch with therapists and find the right fit for working with a teen regarding magical thinking. Please keep in mind that GoodTherapy.org is an exclusive directory. If you have trouble finding a professional in your area, don’t be discouraged–it may mean you’ll have better luck doing a Google search or asking for a referral from a trusted health professional, such as your doctor. Wishing you and your daughter the very best in your search! Ive always been very anxious my whole life but recently have been expressing the symptoms of magical thinking. I take celexa and that helps but its always present to some degree. Anyways i can fix this? I have magical thinking andSometimes it drives me crazy because i dont act like myself, i keep thinking that if i think like a certain way or i think about something, it ill happen or prevent from happening. I dont know if this is serious, but it gave me a hard time. My parents dont understand if i explain and im not sure if its serious and what to do. Just wondering, have you ever paid attention to how long you had been thinking certain thoughts (eg. days, weeks etc) and if any thing you wanted and/or feared came about that matched what you were thinking? Can you relate a couple? If nothing has as yet came about matching thoughts you were thinking could you mention one or two of those anyway? Woah! Calm down. This article is very alarmist. Readers, if you’re worried you or a loved one is magical thinking too much, don’t worry! It’s part of our culture. The article’s example of a tribesman is reductionist and insulting. Plenty of fully functional American/European adults practice magical thinking in the form of karma or mitzvah. It’s a completely normal thing and you should not worry about it so much. It’s the least and most benevolent symptom of any of the above mentioned mental illnesses. There is practically no correlation between magical thinking and OCD or schizophrenia compared to other major symptoms that cause disfunctionality. So if this is what magical thinking is, doesn’t that mean that people who believe in the book “the secret”, meditation, astral travel, or any type of mantra’s are also magical thinking? There are a few teachers out there who are teaching about “paradigm shifts” in your belief system and how that will change your life because you begin to see yourself and others differently and you begin to gain healing, freedom, prosperity etc. from this type of thinking. Isn’t that also magical thinking and why does it work? If you change your mind, how you think etc., you can change what you believe in. I’m a firm believer in the law of attraction. I suffer from anxiety and mindfulness meditation and cognitive therapy has helped me deal with difficult situation. It actually does not teach me to change the world by the way I think. It teaches me to change the way I look at situations I cannot change differently. Seeing the silver lining in situation helps to problem solve. Mediating and being grateful teaches me to look at what’s good and not bad. There’s no hocus pocus. Magical thinking is the belief that one can affect the world through *unrelated* actions (as if by magic), so the idea that changing your beliefs changes your perception and therefore how you act in the world is not “magical” because there is an obvious cause and effect there. Benign magical thinking that does not cause distress would be something like being superstitious. You don’t walk under ladders in case it causes bad luck, for example. This is magical because ladders and your relation to them cannot possibly have any effect on another part of your life (except maybe the possibility of something being dropped on you by someone at the top of the ladder!) That’s not a mental health condition and people use these magical thoughts all the time – some people have lucky charms or mascots, for example. It becomes a condition when it causes distress and starts to control the individual and the way they live. So someone with OCD may have the thought that their children will come to harm if they don’t tap the fridge three times every time they go by. The fear of losing their children then becomes an obsession where they constantly check and recheck – did I remember to tap the fridge? Maybe they then start to need to tap the table too, and then the walls, and then over time it becomes that they need to tap everything they touch three times or they will lose their children. This ritual then begins to take over their lives and they may find it difficult to function on a day-to-day basis because the tapping becomes all consuming. For me it was the rhythm don’t step on a crack or you’ll break your mother’s back. My mother was everything to me I would take hours to walk a block cause I couldn’t step on any cracks then it wasn’t just cracks in cement or pavement it was cracks in the ground. I couldn’t leave my house then it was cracks in the floor boards I couldn’t even see them but what if….. this is what they mean by magical thinking and it is a serious disorder that effects every part of your life.